There is a restaurant here in Vancouver called Lin’s that legit makes the BEST noodles I have ever had. It’s famous for its xiao long bao (soup dumplings) and the noodles are hand pulled fresh every day. It. Is. AWESOME. If I could, I would go there everyday and feast on all the amazing noodles, soups, dumplings, etc. I could get my hands on. While Lin’s is incredibly cheap, eating out even once or twice a week is hard on the wallet. Still, that doesn’t mean you have to deprive yourself of tasty tasty goodness. One of my favorite dishes from Lin’s in the Dan Dan Mian, which is basically noodles in a spicy peanut sauce. Yeah. Delicious. I’ll admit I was a bit hesitant to try and make dan dan mian at first. I figured it would require all kinds of fancy ingredients, technique, and ancient Chinese wisdom. Well, I’m sure those things would help, BUT it turns out these noodles are stupid easy to make. All you do is brown some onions and pork, add in your saucey bits, and let it simmer for a bit. Once that’s all done, pour it over some noodles, try not to cry (into the noodles at least), and enjoy. Stir together the pork and 1 tbsp soy sauce. Heat large pan over medium heat and add pork. Brown pork and then set aside. In same pan, add ~2tsp vegetable oil and cook onion until tender and translucent. Add ginger and garlic and let cook for ~1-2 minutes. Add peanut butter, 2 tbsp soy sauce, chili oil, chili sauce, sesame oil, and chicken stock and simmer for ~10 minutes. Taste your sauce and adjust as necessary. Add pork and cook for 5 minutes. Remove from heat and serve over noodles, garnished with green onions. Lin’s. This week. Let’s do it! Looks Delicious!!! Great ingredients and amazing photo!!! So good! Stickler question: 3 tbsp of soy sauce total??? I love this! Always makes me think “Chinese spaghetti”. Thanks for your simplified version. 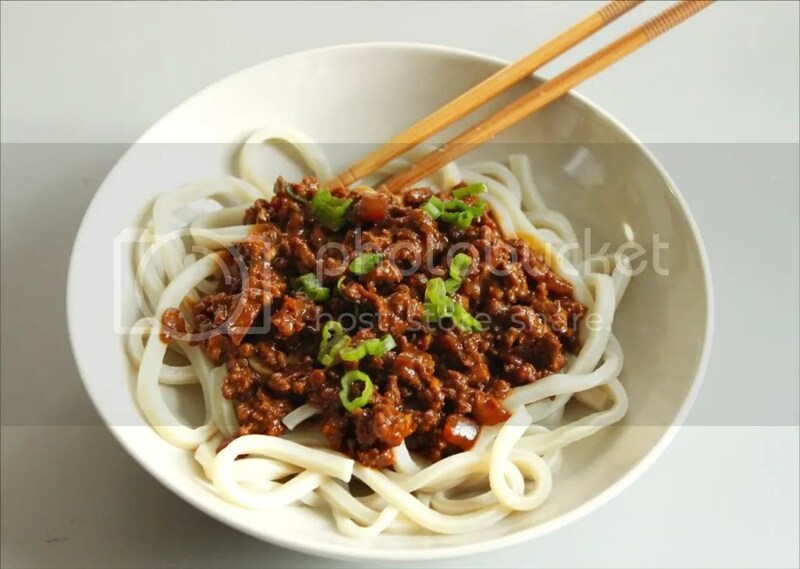 i found this randomly browsing through foodgawker, trying to find a decent recipe for ground pork that wasn’t some meatball recipe. oh. my. god. i made this tonight, it was so easy, and my boyfriend and i both decided it’s in the top ten recipes i’ve made (and i’ve made hundreds of things). thank you so much for sharing this! LOVED this recipe. I’m always looking for easy delicious things to try! So good.